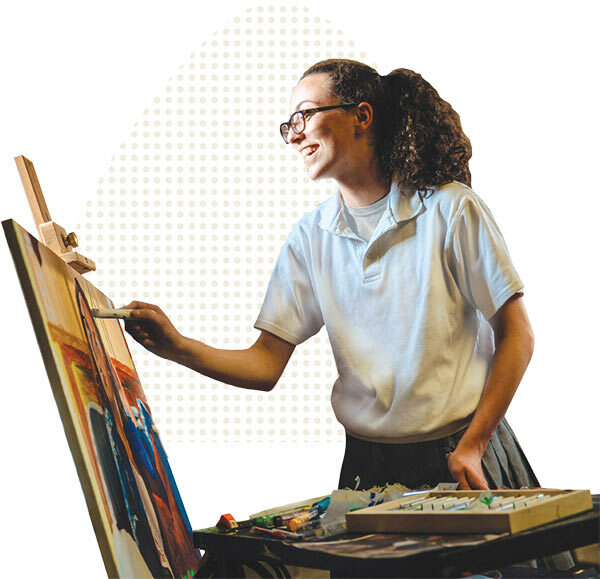 Arts at John Carroll play an integral role in academic and co-curricular school life. Students are enrolled in Arts courses from freshman through senior year, with many opportunities to participate in school performances and productions. Partnering with our accomplished faculty, students are inspired to explore boundlessly, express effectively and communicate confidently; to innovate, ideate, and create. Our job is to provide them with the tools to face the challenges of their tomorrow – to empower them to reach, discover, and develop unique solutions – to design their future with conviction. The curriculum is discipline-based and addresses sequential development of knowledge and skills in diverse and substantive offerings in Visual, Literary and Performing Arts, including Dramatic Arts, Music and College Preparatory Dance. Students who are interested in the Arts can also choose to apply to graduate with a Diploma with Distinction in Fine Arts. Outside of courses, JC has many extracurricular and club opportunities for students to further their arts exploration. Many participate in both fall and spring musical theatre productions, as well as winter and spring concerts. The band marches in numerous area parades and home football games. It also performs at school assemblies, pep rallies, and Open House. Extracurricular dance is also available through the on-campus Academy of Performing Arts and Dance.